B.E., Southeast University, 2002; Ph.D., Shanghai Jiao Tong University, 2007. Assistant Professor, Caltech, 2013-18; Professor, 2019-. The Qian lab is interested in designing and constructing nucleic-acid systems from scratch that exhibit programmable behaviors – at the basic level, such as recognizing molecular events from the environment, processing information, making decisions and taking actions; at the advanced level, such as learning and evolving – to explore the principles of molecular programs that nature creates, to embed control within biochemical systems that directly interact with molecules, and eventually, to re-create synthetic molecular programs that approach the complexity and sophistication of life itself. To construct sophisticated biochemical circuits from scratch, one needs to understand how simple the building blocks can be and how robustly such circuits can scale up. 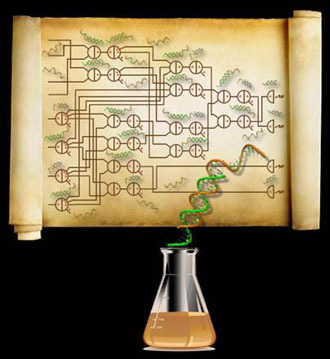 Using a simple DNA reaction mechanism based on a reversible strand displacement process, we experimentally demonstrated several digital logic circuits, culminating in a four-bit square-root circuit that comprises 130 DNA strands. These multilayer circuits include thresholding and catalysis within every logical operation to perform digital signal restoration, which enables fast and reliable function in large circuits with roughly constant switching time and linear signal propagation delays. The design naturally incorporates other crucial elements for large-scale circuitry, such as general debugging tools, parallel circuit preparation, and an abstraction hierarchy supported by an automated circuit compiler. Before neuron-based brains evolved, complex biomolecular circuits provided individual cells with the 'intelligent' behavior required for survival. However, the study of how molecules can 'think' has not yet produced artificial chemical systems that mimic even a single neuron. Building on the richness of DNA computing and strand displacement circuitry, we show how molecular systems can exhibit autonomous brain-like behaviors. We systematically transform arbitrary linear threshold circuits (an artificial neural network model) into DNA strand displacement cascades that function as small neural networks. 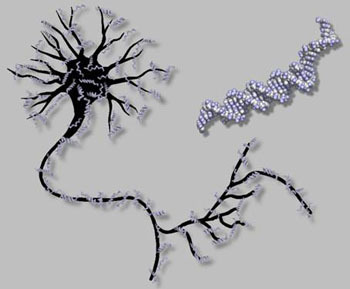 Our approach even allows us to implement a Hopfield associative memory with four fully connected artificial neurons that, after training in silico, remembers four single-stranded DNA patterns and recalls the most similar one when presented with an incomplete pattern. Our results suggest that DNA strand displacement cascades could be used to endow autonomous chemical systems with the capability of recognizing patterns of molecular events, making decisions and responding to the environment. It is amazing how "dumb" animals such as insects, birds and fish show intelligent behaviors as groups. For example, ants can find the shortest path from the nest to food no matter where the food source is. Termites can gather wood chips into piles no matter how the wood chips are originally distributed. On the other hand, despite wide interest in building molecular robots, the complexity of such demonstrations remains low. A state-of-the-art DNA robot can take a few steps, follow a two-dimensional track, make a choice at a branch, and pick up cargos. To carry out more complex tasks, we are interested in developing molecular robots with collective behaviors, inspired by swarm intelligence in animals. With a simple set of functions such as random walking, modifying tracks, picking up and dropping off cargos, we seek to show that molecular robots can be programmed to perform sophisticated tasks such as solving mazes and sorting targets.